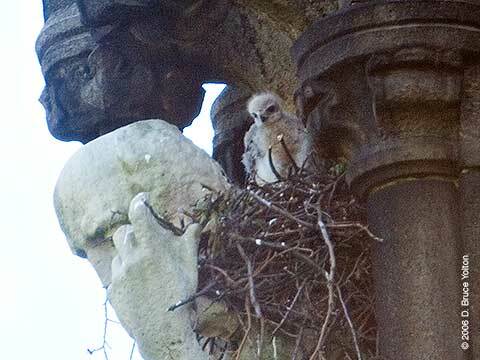 The Cathedral Church of St. John the Divine (or St. John the unfinished, since it is only partially completed) sits above Morningside Park just northwest of Central Park next to St. Luke's Hospital. 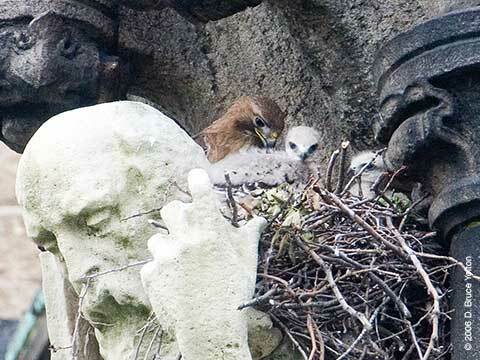 The Cathedral has had Red-tailed Hawk nests in the years past, but I hadn't heard any news about a current nest from any of the Central Park birders. 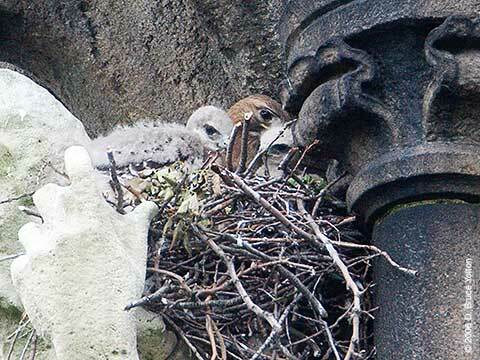 Out of the blue, Bill Green emailed me early last week, that there was a Red-tailed Hawk nest on the Cathedral. 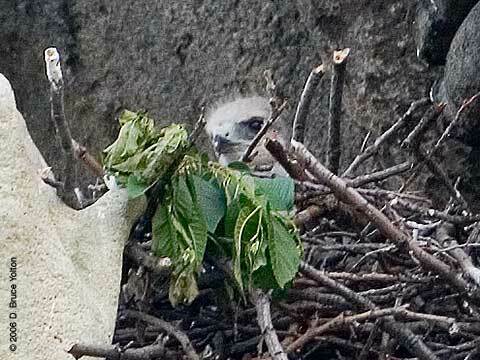 Tuesday it was raining very hard, so I had to wait until Wednesday to go up and see the nest. 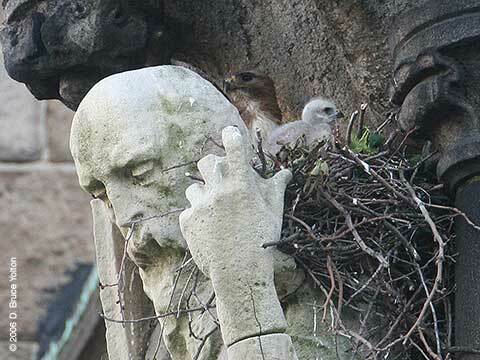 The nest is located on the east end of the Cathedral, just behind the altar. (This is true east, not Manhattan street grid east. 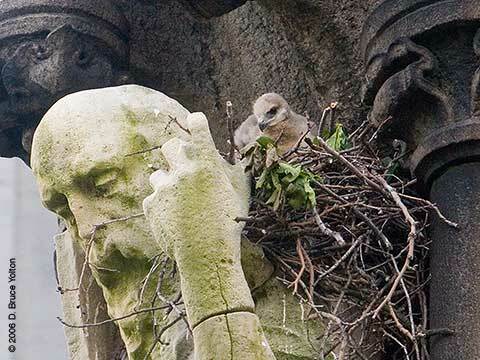 If you're used to thinking the grid is due north, the nest is NNE.) 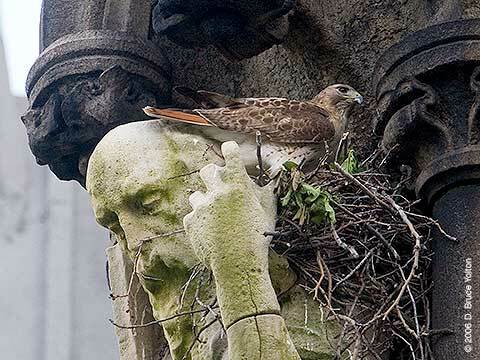 This is a new location, as the old nest was on the western side of the building. 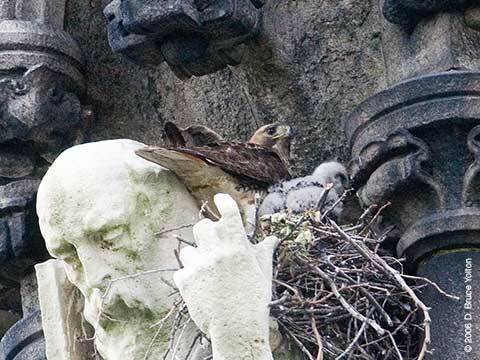 The nest sits on the shoulders of a statue about 100 feet up. 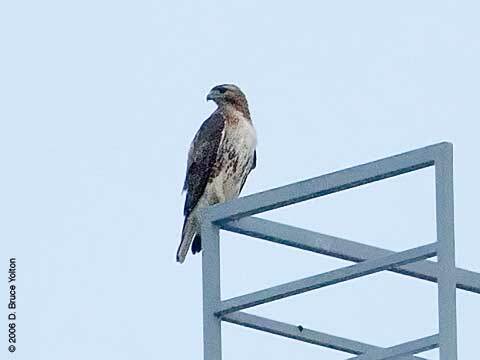 The Red-tailed Hawks can enter from either side. 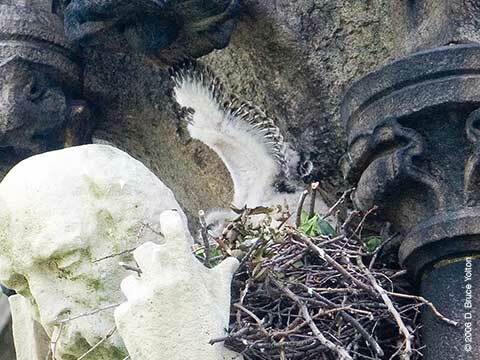 An ornamental top above the statue protects the nest from rain and the nest seems well built and very stable. 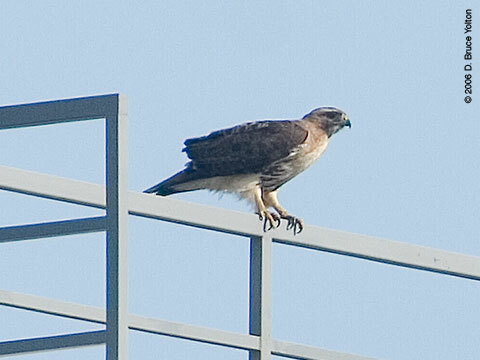 Almost as soon as I arrived on Wednesday, a Red-tail appeared. 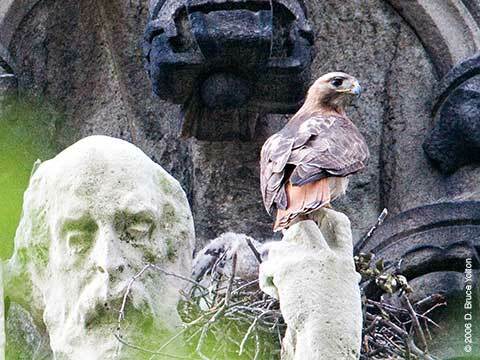 The Red-tailed Hawk looked stunning behind the hand of the sculpture. 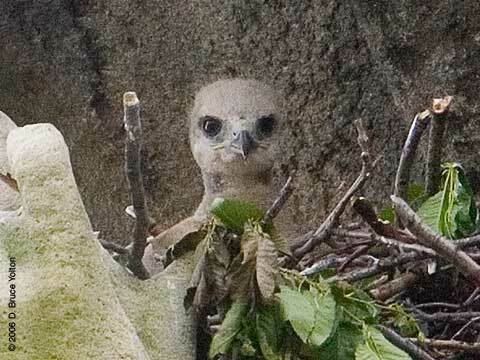 Imagine my surprise when I saw there was an eyas in the nest. 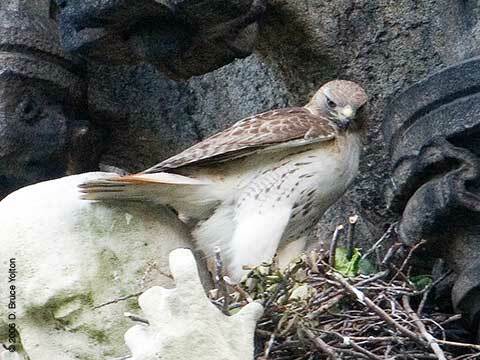 The adult female wasn't just sitting on the nest. 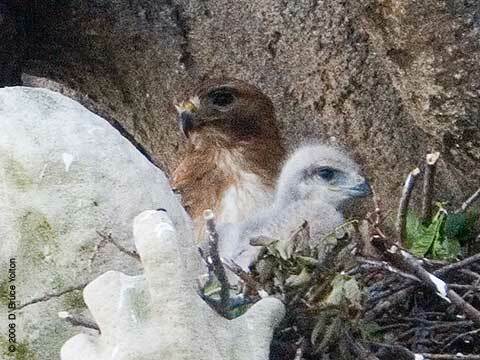 She was already a mother! 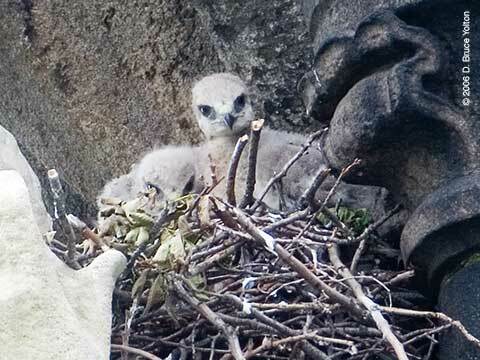 What a nice surprise, given the nest failures lower in Manhattan on both the Fifth Avenue and Central Park South nests earlier this year. 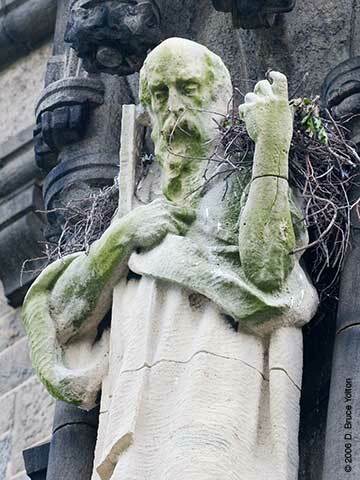 The father arrived later that evening, and perched on what we would learn was his favorite spot in the late evening, an ornament at the SE corner of the St. Luke's Hospital building at 113th and Morningside Drive. 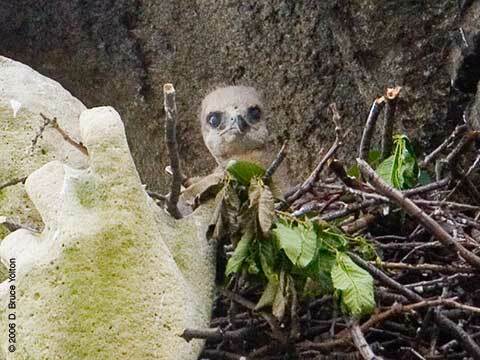 It was interesting to see how much fresh material was on the nest. 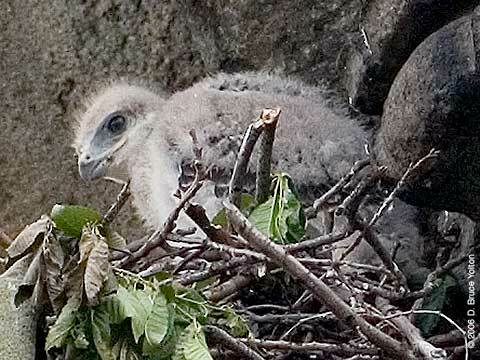 I was able to get a few baby pictures. 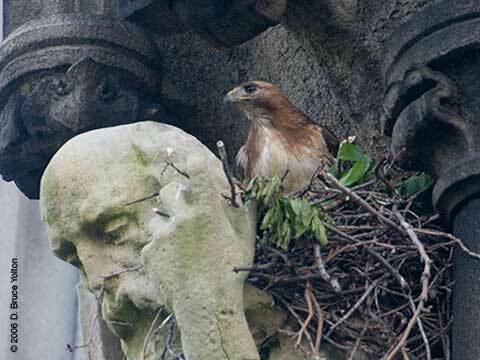 The father sitting on the St. Luke's Hospital perch. Note the light belly band and the lack of color on his shoulders. 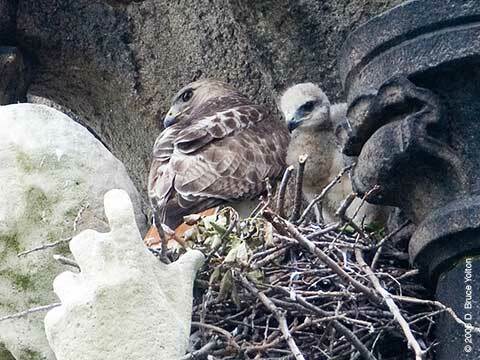 The mother has color on her shoulders and a darker belly band, although as Red-tailed Hawks go, she's rather light colored. When I arrived on Friday evening, no one could be seen. 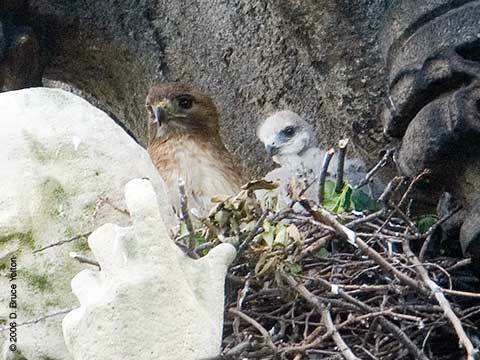 The mother then appeared but very quickly left the nest. 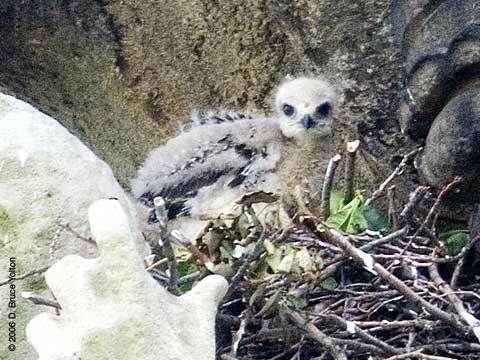 An eyas soon popped up and began to flap around. 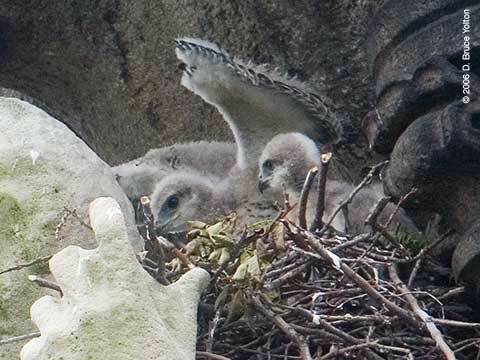 John Blakeman was kind enough to give me an estimate of the eyas' age, 14-18 days. 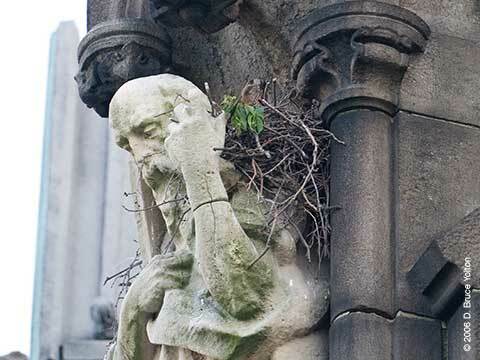 This is really one of the most beautiful nest locations I've ever seen. 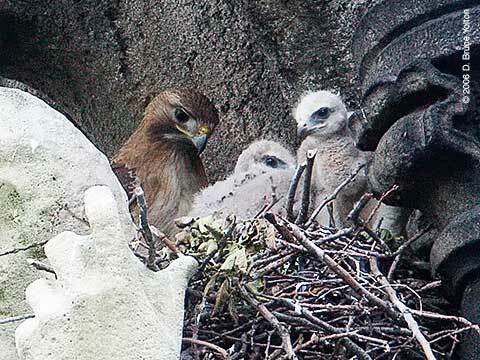 On Saturday, I spent the late afternoon at the nest. 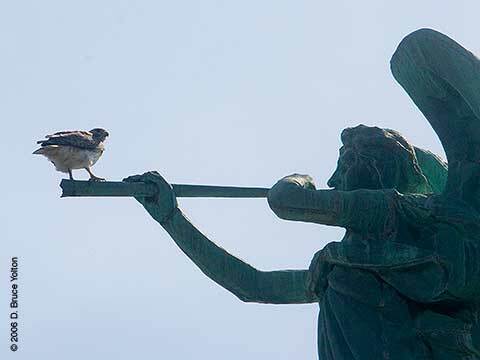 One of the adults was on the sculpture of Gabrielle blowing a trumpet soon after I arrived. 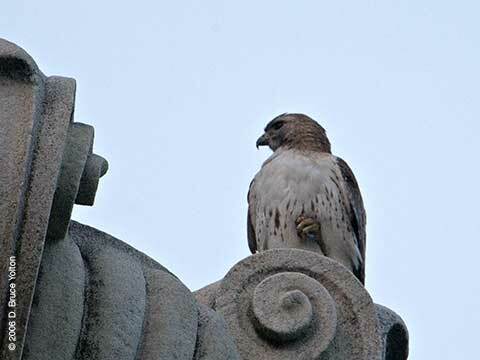 The father perches about 20 feet from the nest. 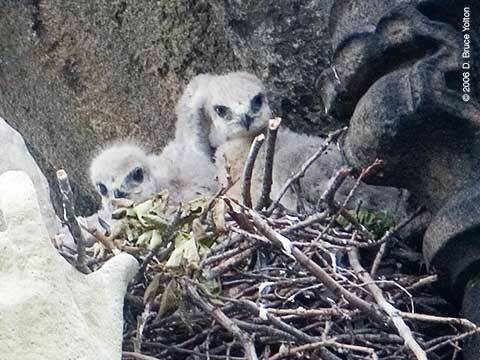 The chick seemed very well fed with feedings every few hours. 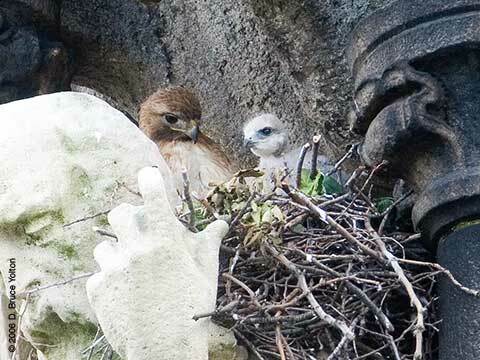 Two adults and a baby. The father just before he flies off. 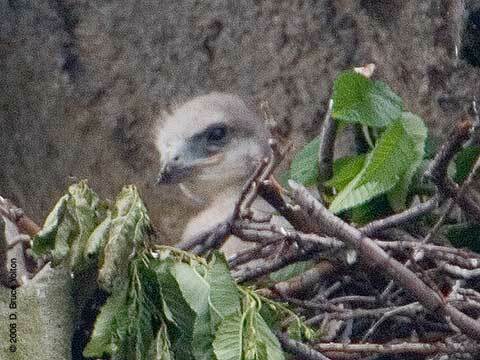 On Sunday, I spent six hours in the afternoon and evening looking at the nest. 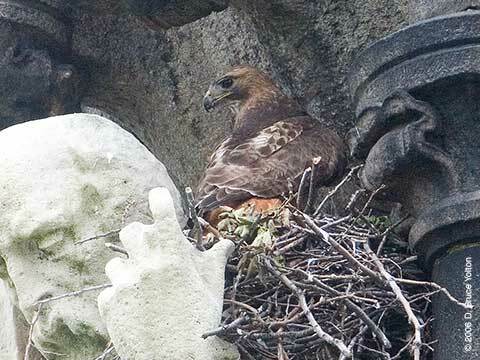 When I arrived the mother was on the nest. 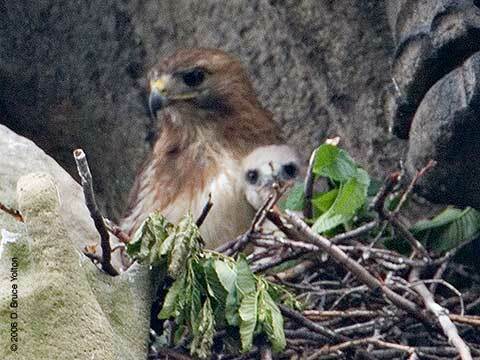 She soon left and after thirty minutes, two eyasses were visible. Yes, two! They looked great together. 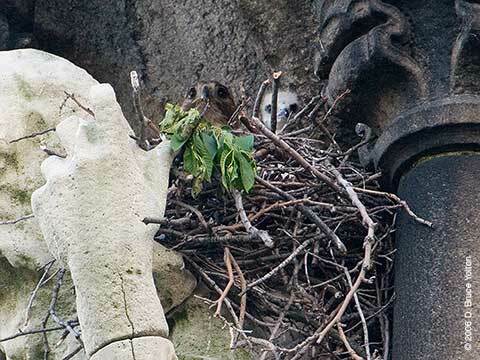 The nest looks to have a very deep bowl. 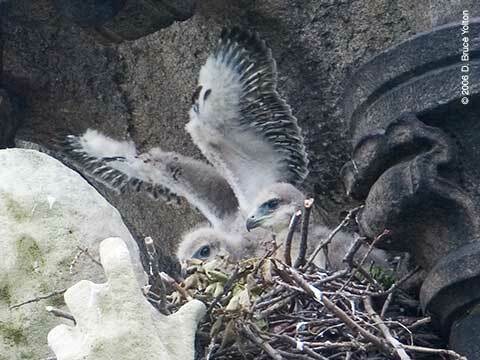 I wonder if the eyasses need to reach a certain developmental stage in order to be able to climb to the edge. Will we find another one in a few days? Who knows? 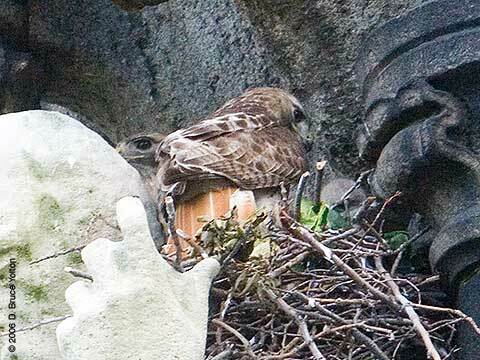 Mid-afternoon the mother arrived with food. She stays for a while and then leaves. 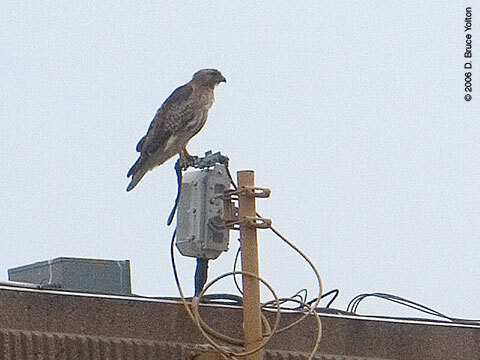 We find her perched on a building a few blocks east on 110th Street. 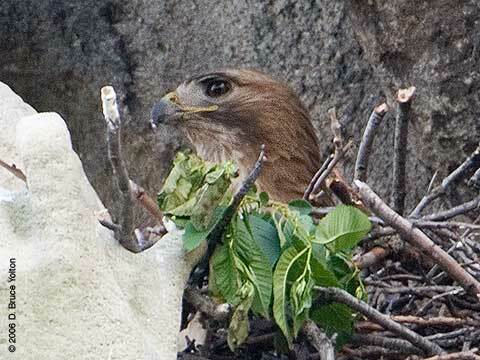 We lose sight of her but she soon returned with some food. 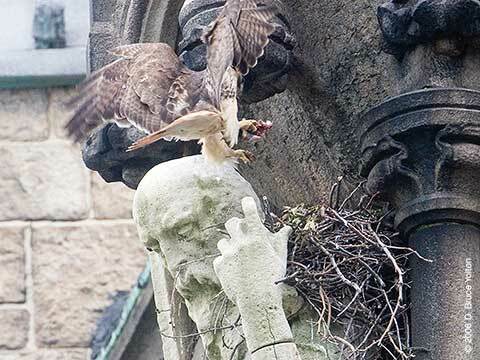 She perches on a cross 20 feet below the nest on a side chapel that is behind the altar. 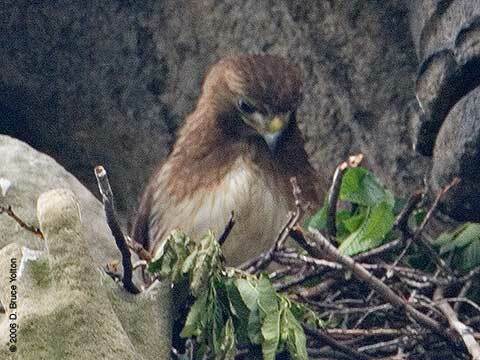 She enters the nest from the left. 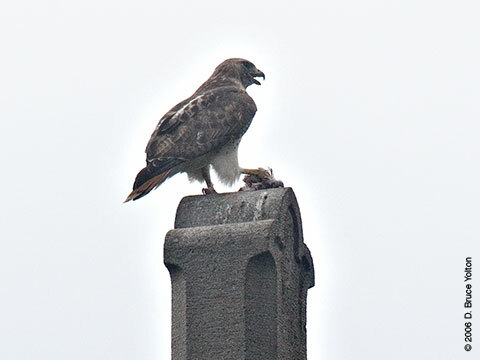 She appears to be eating with the eyasses, although it could be that she is helping to feed one of them. 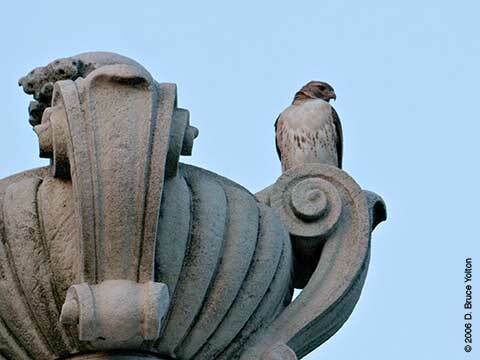 The father returns to his St. Luke's perch. 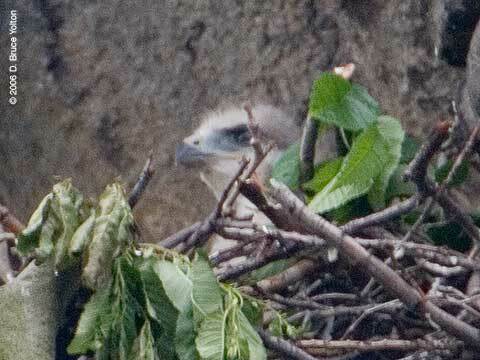 All is quiet for over an hour in the early evening and then a chick appears. 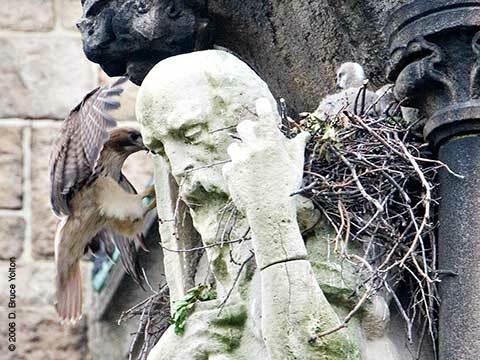 The mother is on a building on 110th just below Morningside Park. 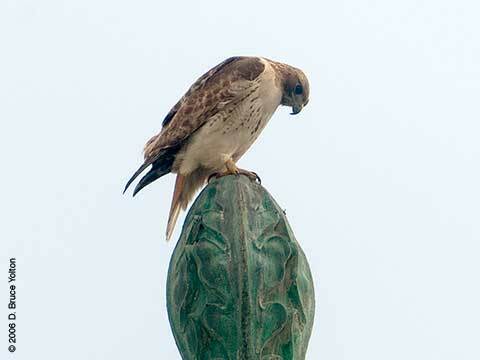 She adjusts her stance to let the wind blow through her feathers. Was she drying off after the early afternoon shower? 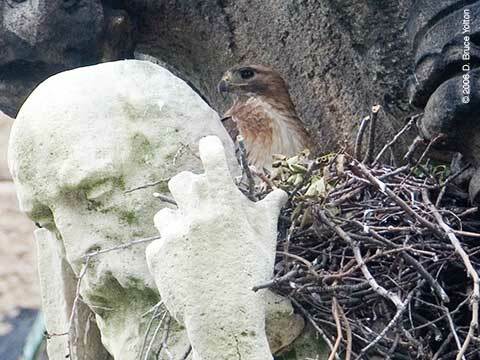 The mother returns and sits on the hand of the statue. . .
. . . before hopping into the nest. What a wonderful five days of birding. 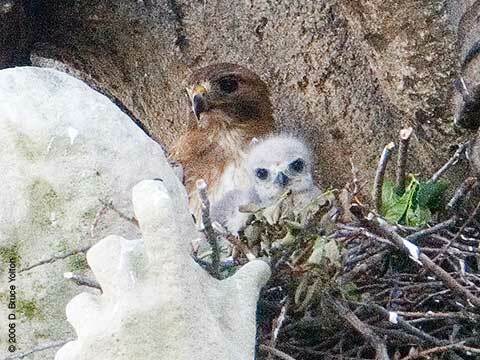 I don't think these birds need to be named. 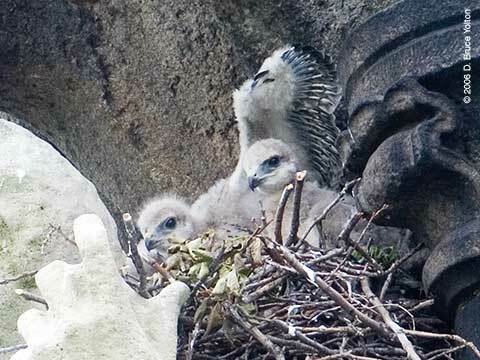 But if it turns out folks want to name them, I think we should ask the children of the Cathedral School to do the honors. 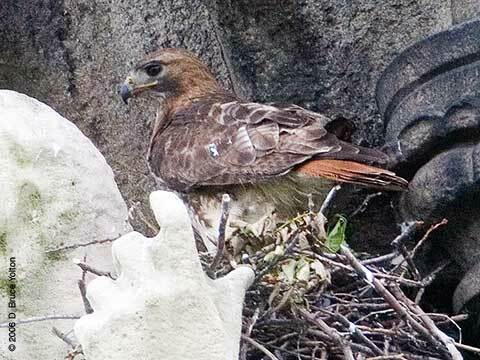 These Red-tails are their neighborhood birds, not ours. 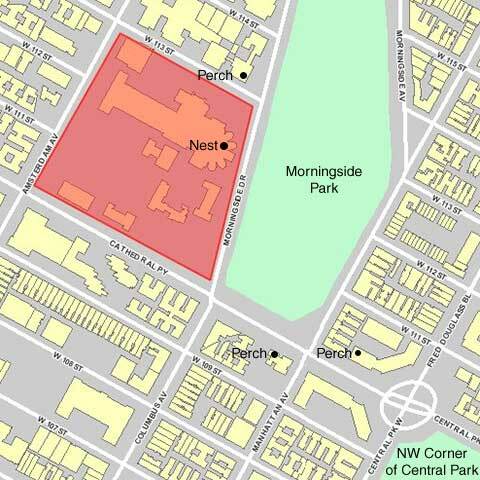 I spent a lot of time on 113th Street these last five days, and if you live in Morningside Heights, you should be proud of your neighbors. I met the nicest people. They shared their knowledge of the hawks, asked great questions, welcomed me and had the manners you would expect to see in a small town. 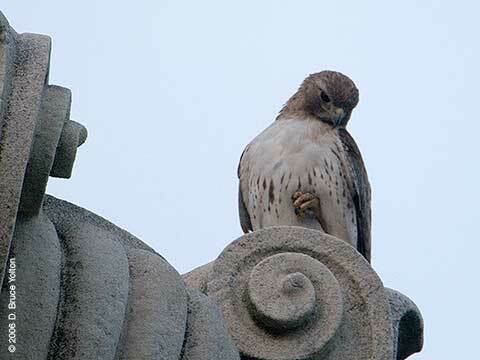 It was nice to discover that Morningside Heights is a real neighborhood. 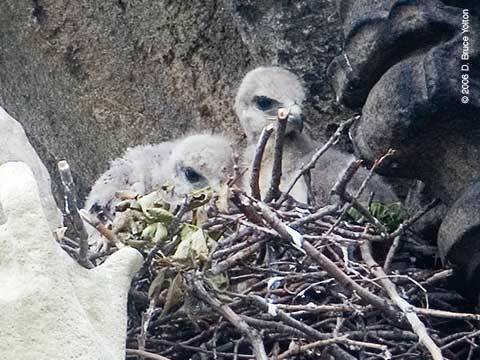 If you go up to see the nest, don't expect instant gratification. 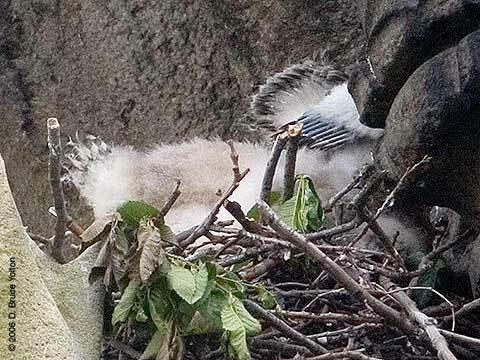 There are long periods where the parents can't be seen and the young are sleeping. Expect to spend an hour or two. 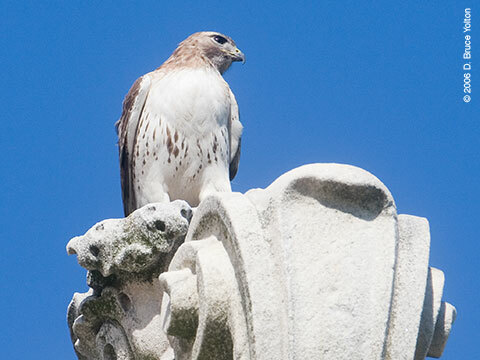 If it's too boring, you can go to Morningside Park, do some birding and come back. You will need binoculars, but you don't need a telescope.